This might sound odd, but I hadn’t been paying much attention to Crashlands ($6.99). I had read the inspiring story behind its genesis, and I knew it was some sort of crafting game. I knew the developer, Butterscotch Shenanigans, has always turned out quality games. But because I had initially pegged it as being something outside of my usual interests, my eye was off the ball. I’m glad for that, because it allowed me to approach this game without too many preconceptions or any sort of hype build-up. If anything, I wasn’t sure if I’d like it as much as another reviewer might, since I rarely get deeply into games built around crafting mechanics. 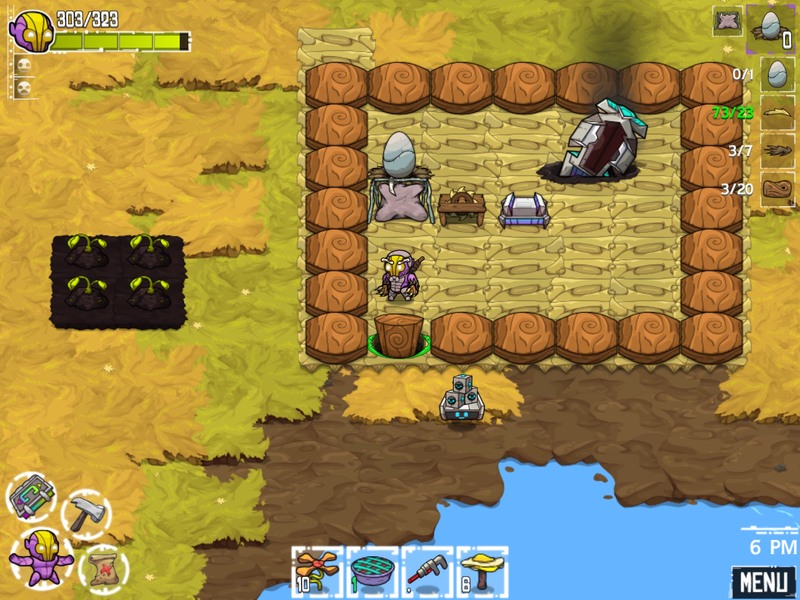 Crashlands had to win me over, in other words, and my biggest surprise is how fully it did so. Several hours into the game, as I was frantically weaving my way through angry floating squids and fire-belching rock monsters, trying to gather up enough essence to upgrade my latest pet without getting killed yet again, I knew it had its hooks into me, and it didn’t take too much thinking to figure out why. 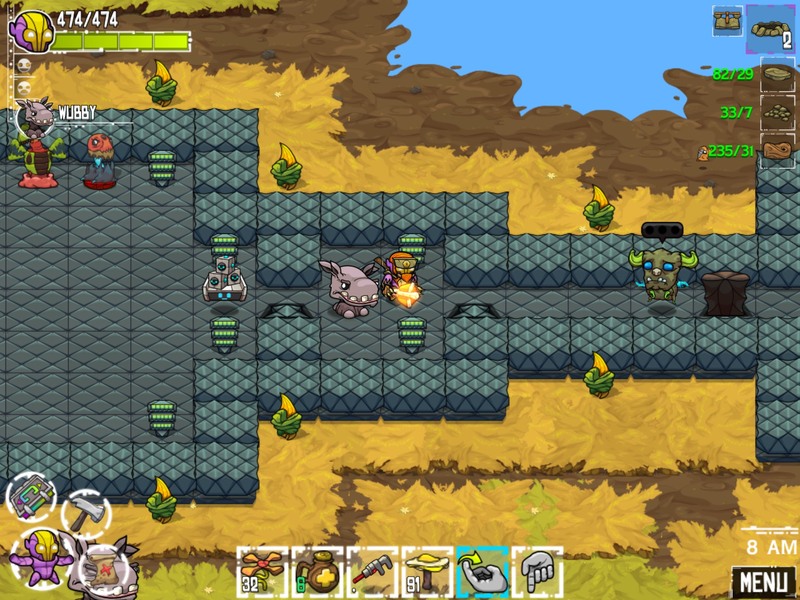 I’m not sure whether to call Crashlands a crafting game with an action-RPG bolted onto it or an action-RPG with a crafting game bolted onto it, but either way, it’s an incredibly compelling mixture of mechanics. It’s also a design masterpiece, from the way it doles out its many treats in careful measurements to the way it streamlines a lot of the more irritating elements typically found in games with crafting systems. I could go on for days about any little bit of the game, and who knows? I just might. Let’s see where this review goes. The basic premise of the game has some jerk stealing a part from your spaceship, causing you to crash on a nearby planet. You’ll need to repair your ship, but to do that, you’re going to need some parts that can’t exactly be found in the local 7-Eleven. You’re given your first crafting station, told to gather up some grass, and you’re off to the races. At first, you won’t even have access to a weapon. Instead, you’ll get your first crafting tool, a saw, which is automatically incorporated into your character’s suit. Yes, you won’t need to fish around in menus or swap out tools constantly in Crashlands. Whichever tool suits the job is the one your character Flux will use. And they’ll never break, either, so once you have the tool you need, you’ll always have it. With that saw in hand, you’ll have to go find some wood, a task which will likely run you into the local wildlife for the first time. With no weapon to fight back, all you can do is try to stay out of their way, a job made slightly easier by the game using red markers to highlight the path of any incoming attack. So, only a few minutes into the game, you’ve already learned the behavior patterns of at least one type of enemy and how to evade attacks. It’s not long after that you’ll craft your first weapon. It might be a good one, or it might be a rather plain one. Crafting any gear in Crashlands will produce a slightly different result every time. Sure, it’ll always be a Level 5 Hammer, but it could be a Satisfying Level 5 Hammer Of Coldness or an Excellent Level 5 Hammer Of Toxicity or any number of other variations. Old gear can be broken down to recover some components, so if you want to re-roll a gear piece to see if you can get a better result, it’s not a total loss. Gear increases various stats, with the most obvious and important being your attack power and HP. Unlocking and creating new gear sets is basically like leveling up your character in an RPG. If you’re particularly good at dodging and are extremely persistent, you don’t technically need to update your gear, but it makes things a lot easier. Plus, it changes the appearance of your character, so it’s fun to upgrade even from a simple visual standpoint. With a weapon in hand and maybe even a bit of armor to cover yourself up, you’re now ready to start taking on some one-legged hippos. That might go fine, but if it doesn’t you’ll discover how Crashlands handles death. You’ll respawn back at your home point with low HP, with some of your most recent recovered materials lost. Make your way back to the point at which you died, which is helpfully marked on your map, and you’ll get those materials back, plus a gravestone to commemorate the occasion. That’s it. Oh, and whatever enemy you might have been trying to whittle down will be back up to full HP, which can be a bit of a bummer but isn’t the end of the world. Having to march your way back and start beating down whatever you were trying to kill from scratch is enough of a punishment to make you want to avoid death, but the general leniency of the game means players of all skill levels will be able to move forward eventually. Your gravestone isn’t the only thing that will be marked on that handy map. Points of interest related to any quests you have open will be clearly marked, and any teleporters you find will also be highlighted. If you want to travel to any of those teleporters, you can just tap them and you’ll be there. You can teleport out from anywhere, provided you’re not in the middle of a fight, so traveling far away from your home point is relatively risk-free. Go ahead and explore. Just keep an eye out for teleporters as you go to make sure you’re leaving a trail of bread crumbs behind you. As for the quests, you’ll get those from a variety of sources. Some of them are critical to moving the story forward and opening up essential new tools and items, while others are side-quests that offer up enticing bonuses but aren’t required for progression. You can tackle them as you like, or ignore them and build a giant house if that’s your thing. 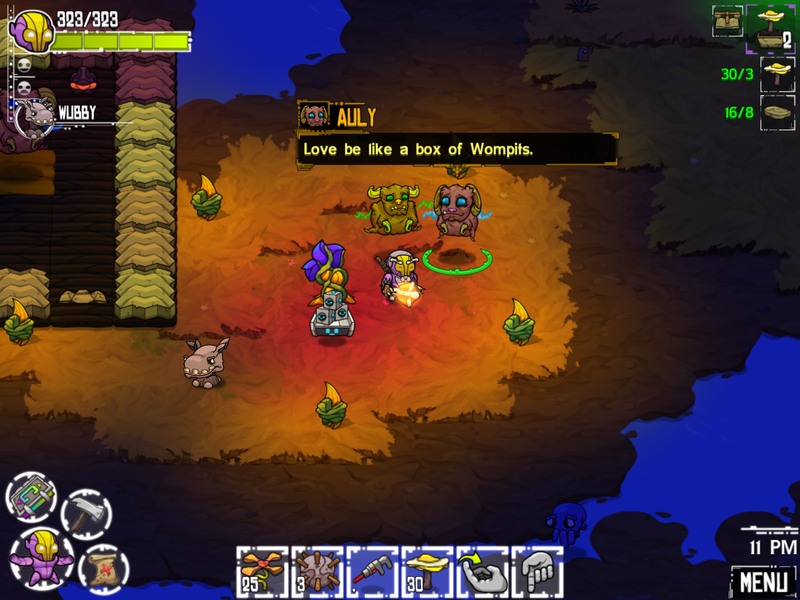 Crashlands uses quests to slowly open itself up to the player. You can’t craft any object unless you have a recipe for it, and while new crafting stations will come with a small selection of recipes, you’ll have to find the rest on your own. The critical ones, like new tools, come from the main quests, while optional things like chairs, beds, special carpets, and so on can randomly be found while gathering resources. The optional items make for fun little rewards for players who are diligently collecting resources, but the game’s core structure is built around the big things. It takes its time teaching you the ins and outs of each new toy, and every time you get a new one it feels like a major accomplishment, one that opens up even more possibilities. All of your active quests can be perused from your quest log, making it a simple matter to check what needs to be done at any given time. It’s easy to lose hours of time following along the little daisy-chains of quests, even though from a gameplay point of view you can stop at any time without losing anything. There are lots of fun secrets, too. Every so often you’ll get a rare material, or a monster egg, allowing you to create legendary gear or raise your own pet. Once you’ve hatched a pet and named it, you can bring it out with you to support you in battle, feed it to get some milk or other supplies, or upgrade it into a more powerful form by crafting it a fashionable accessory and equipping it. Having a pet makes combat a lot easier, too, since you can focus on kiting the monster while your little buddy takes shots at it. It’s generally pretty easy to stay out of the way of a single enemy, but getting in your own shots or handling a group can get pretty hairy, so you’ll be happy for the help. Beyond your first pet, however, getting an egg from an enemy is rare, so you’ll either have to get lucky or put in some time if you’re looking for a specific one. The controls and user interface work really well. You move around by tapping where you want Flux to go, and tapping on any object will automatically perform the appropriate action or let you know what you need to have if you can’t. There’s a hot menu at the bottom of the screen where you can place items you want to access quickly, such as potions or bombs, and your map, status screen, and quest log are available at the press of a button. Crafting is as easy as gathering the necessary materials and tapping on what you want to make, while construction is done in a separate interface that you bring up by tapping a button. From there, you tap the item or material you want to place, then tap where you want to put it. If you place something incorrectly, simply tap it again to pick it back up and put it in the proper place. If you’ve got your eye on crafting a particular item that requires more materials, you can hit a button to track it and have those materials displayed on the side of the play area. Make sure to bring lots of grass floors around with you when you go out, by the way. They make handy bridges. This review is going on a bit long and I’m probably getting too granular with my points, but I’m just really excited about Crashlands. It’s unbelievably well-designed down to virtually the last detail, and I can’t help but appreciate every little brush stroke. Pushing that all off the table for the moment, Crashlands is simply an excellent game that is a lot of fun to play. Every time I open the game to check something really quickly for this review, I end up playing it for another hour. It’s the most enjoyment I’ve had with any crafting game, and is honestly one of the best games I’ve played on iOS. It’s exceptionally rare for a game that has both open world emergent gameplay and a linear main quest to not drop the ball on one of those things or the other, but Crashlands nails it on all counts. Consider this one an absolute essential. 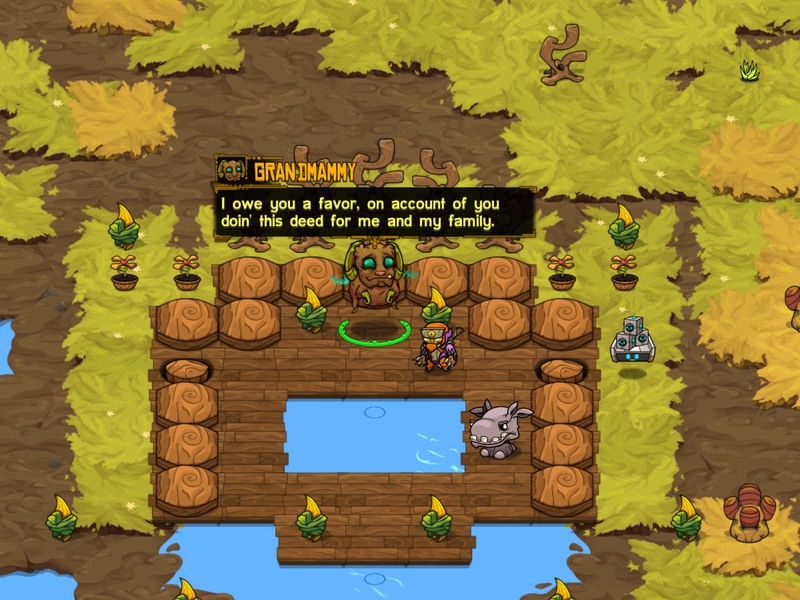 Editor’s Note: Shaun specifically reviewed the iOS version of the game, but Crashlands will also be available on Steam and Android. We’ve been told that if you sign up and log in to your BscotchID, progress will not only be synchronized across iOS devices, but also other platforms.